There are just so many types of toothbrushes, I didn't even know. I think the sale was awesome, though. wow I love the red colour as sensitive. Too bad miss out this roadshow. Rm11 is considered quite cheap bfor good toothbrush :D gonna stock up some! Brush them teeth and they will smile with you, my mum always say. Cute toothbrush..it is nice colorful. But, it is expensive? Never try this brand before so gonna try lah one of these days when I have to start on a new toothbrush! Love the variety of colors that they have on the toothbrushes Wendy :) So pretty! 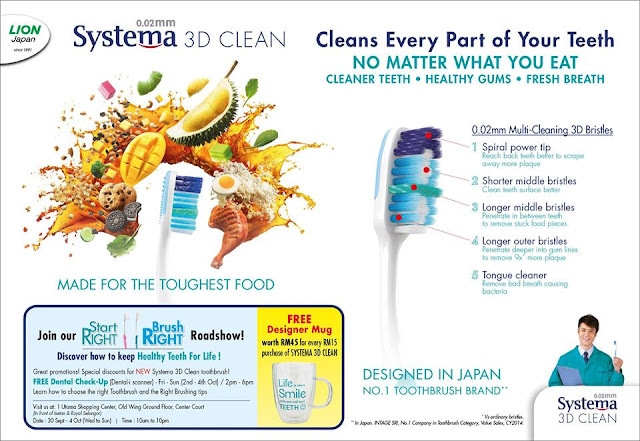 a toothbrush which i think really works. Haven't seen one like this in a while.